Reliance Industries Limited Chairman Dhirajlal Hirachand Ambani became the 24th person and the first Indian to be awarded the Wharton School Dean's Medal. At a glittering ceremony in Bombay on Monday evening, politicians, businesspersons, the Reliance staff, and a huge media corps turned out to felicitate the chairman of India's largest private sector company, Reliance Industries Limited. 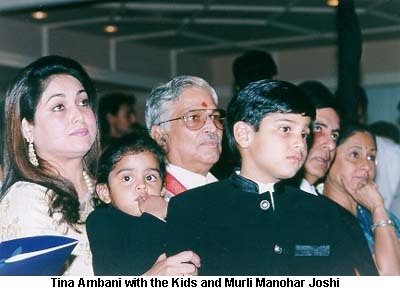 In his acceptance speech, Dhirubhai said he accepted the award in humility and on behalf of the Ambani family comprising his immediate family, the staff of Reliance, the dealers and associates, and his huge investor family. He said that even as he spoke, 80,000 workers were toiling away in Jamnagar, Gujarat, which was devastated in the recent cyclone, to repair the damage to the Reliance petrol refinery in record time and he was proud of them. Ambani said while he was satisfied at having created wealth for over 5 million shareholders, he added that it was not enough and that wealth needed to be created for 500 million people. "Our dreams have to be bigger, ambitions higher, commitment deeper and efforts greater. This is my dream for Reliance. It is my dream for India," he said. Ambani said he was inspired by the determination of American pioneers, who laid the foundation of the world's richest nation. "They gave respect to the creation of wealth," he said, adding that the Indian ethos was no different. He said every Diwali, Indians worship the goddess Laxmi, but the meaning of this ceremony was lost along with the country's freedom. Bureaucracy became the most respected institution, and even after Independence, the mindset remained the same, he stated. However, he added that big changes are taking place and this evening was a proof of the same. To the youth, he advised them not to accept defeat and to challenge the negative forces, and they would certainly win. "You will succeed because India is no longer in the feudal age," he declared. The award winner pointed that today pedigree did not matter but performance did. He urged greater speed in making India an economic superpower in the next 25 years. 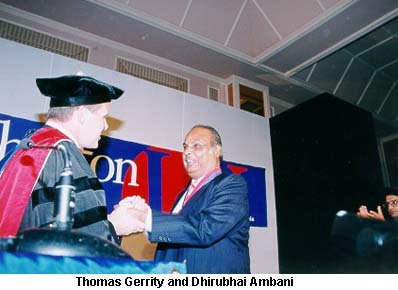 Presenting the medal, Dean Thomas Gerrity of the Wharton School, University of Pennsylvania, United States, said the award was in recognition of Dhirubhai Ambani's entrepreneurial ability and to recognise the triumph of the human spirit. Gerrity pointed out that Dhirubhai (the term he preferred) had created world standards at a time when the Indian economy was closed and most other industrialists were only too pleased to operate in a protected environment. He said that when Reliance had difficulty finding funds for business, Ambani had gone to the people and sought the funds of investors. The first Reliance public issue in 1977 had 58,000 investors; today there are four million equity holders! Reliance, he said, was responsible more than any other in creating an equity culture in India. Moreover, it had always rewarded the investor well, at an average of 30 per cent dividend, when such was not the fashion. Today, said Gerrity, Reliance is a global company, and it is building the world's largest grassroot refinery at Jamnagar. All this from a businessman who started his operations from one small room in Bombay and lived in a one-room tenement with his wife, four children, and two more relatives. Tracing the incredible Ambani saga, the dean reminded the audience that, unlike many other industrialists today, Ambani boasted no pedigree. He was the third of five children of a school teacher in Chorwad, a village in Gujarat. The recipient of an award from the world's leading business school could not afford university education! 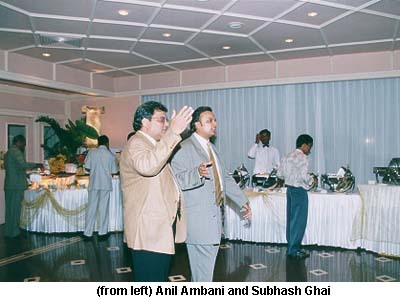 Gerrity recalled that Dhirubhai started his career at the age of 17, when he went to work in Aden in 1958. "He started as an attendant at Shell Petroleum, and soon learnt everything in the business. He became the manager and it was here that for the first time he dreamt big." 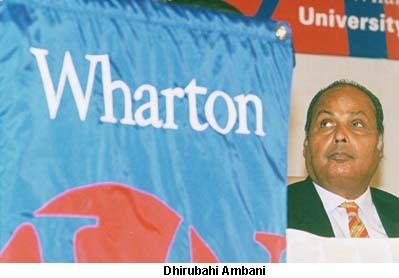 The Wharton don told the audience that on his return to India, Dhirubhai began trading in textiles and commodities in 1966. "At one time, Dhirubhai sold dirt to an Arab sheikh who wanted grow roses in the desert," said the dean. From a trader, Dhirubhai began his great process of backward integration. "He saw the rising demand for polyester, and set up his first mill in 1966 with an investment of just Rs 2.7 million," said Gerrity. 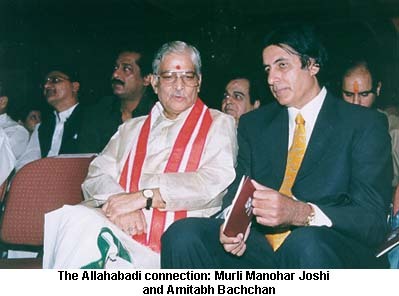 He pointed out that Dhirubhai was a great believer in modern technology and fully trained workers. "In 1975, a World Bank team concluded that only the Reliance factories would be acceptable in the developed countries," he said. Also speaking at the ceremony, former finance minister Palaniappan Chidambaram said Dhirubhai's achievements are a triumph of vision over an inward-looking habit and a triumph of faith and confidence over criticism. The former finance minister pointed out that Dhirubhai had gone to create wealth when doing so was considered a lowly profession. 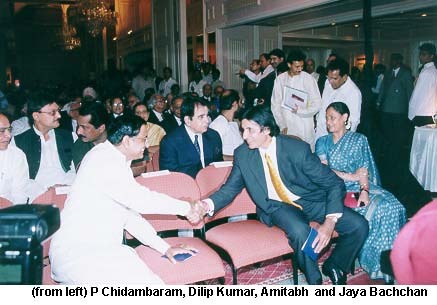 Chidambaram added that he saluted Dhirubhai for choosing not to become a non-resident Indian. Maharashtra Chief Minister Manohar Joshi --tongue firmly in cheek -- said that all school teachers or sons of school teachers achieve greatness. Joshi, incidentally, is also a teacher and runs his own private classes. 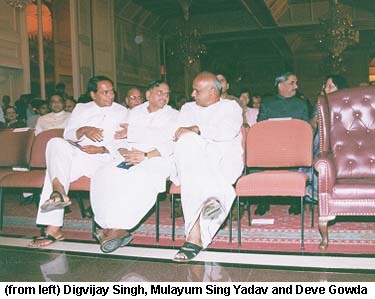 Madhya Pradesh Chief Minister Digvijay Singh said before he felicitated Dhirubhai, he would salute his wife, Kokilaben Ambani, for the support she gave her husband. He also asked Ambani to invest in his state.